We’d love your help. Let us know what’s wrong with this preview of The Art of the Short Story by Dana Gioia. 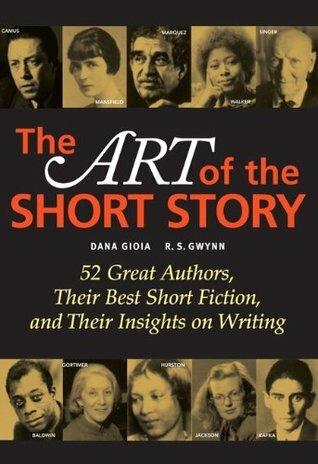 This affordably-priced collection presents masterpieces of short fiction from 52 of the greatest story writers of all time. From Sherwood Anderson to Virginia Woolf, this anthology encompasses a rich global and historical mix of the very best works of short fiction and presents them in a way students will find accessible, engaging, and relevant. The book's unique integrati This affordably-priced collection presents masterpieces of short fiction from 52 of the greatest story writers of all time. From Sherwood Anderson to Virginia Woolf, this anthology encompasses a rich global and historical mix of the very best works of short fiction and presents them in a way students will find accessible, engaging, and relevant. The book's unique integration of biographical and critical background gives students a more intimate understanding of the works and their authors. To ask other readers questions about The Art of the Short Story, please sign up. George Rife I just bought a used one from Betterworldbooks.com for about $7.50, free shipping. I really liked the layout of the book. There were fifty-two (52) authors presented, with sixty-three (63) short-stories. The authors were arranged in alphabetical order. For each author there was biographical information, a short-story (some had more than one story), and an “author’s perspective.” There is a diverse group of accomplished authors from many countries. The “author’s perspective” is an interesting way Gioia and Gwynn used to share more intimate knowledge about the 52 authors. Sometimes the perspective was about the short-story presented. However, often the author shared their thoughts about writing, race, gender, or about themselves. I was personally unfamiliar with many of the authors. The exposure to new authors was an added benefit to reading this book. Some of my favorite authors in the book are Sherwood Anderson, Margaret Atwood, James Baldwin, Anton Chekhov, William Faulkner, Zora Neale Hurston, Franz Kafka, D.H. Lawrence, Alice Munro, and Leo Tolstoy. I recommend this book to anyone interested in short-stories. I'm so proud of myself I finished my required reading *pat on the back* for 9th grade. I deserve a cookie. I'll probably have to read the other short stories later, but for now I'm proud of myself. My favorite short stories in this book are The Tell-Tale Heart by Edgar Allan Poe and The Lottery by Shirley Jackson. When I bought this book it had a front and back cover. Three years ago, a lifetime ago, I thought I would spend more than an hour a year writing. I looked into writing classes and saw this book on the syllabus for one online class. I didn't take the class, but I've been reading this book since then. I discovered so many writers. Sherwood Anderson, Joseph Conrad, James Baldwin! Shirley Jackson, Jorge Luis Borges, Albert Camus, Alice Munro to name a few. My readings inspired more readings. I subscri When I bought this book it had a front and back cover. My readings inspired more readings. I subscribed to The New Yorker, I tried reading James Joyce (god, what a headache-inducing exercise). I meandered off to read Stein on Writing and (Gardner's) The Art of Fiction. I began to understand what the editors meant when they referred to different literary styles employed by the writers, slowly I came out my haze of ignorance. I began to recognize what it is the masters were doing, I began to write more self-consciously. Writing self-consciously is exhausting. I stopped writing. I think I read 55ish of the 61 stories in here. The editors tried as hard as white men can to provide an array of diversity in authors but I still felt stifled, perhaps because the overwhelming majority of the stories seemed to come from the 1920s - 60s. I would have ordered things differently, and not included a picture of goddamn Ernest Hemingway at the introduction. Several selections were exactly what I'd desired: pieces that say something new and profound by authors who excel at their craft I think I read 55ish of the 61 stories in here. The editors tried as hard as white men can to provide an array of diversity in authors but I still felt stifled, perhaps because the overwhelming majority of the stories seemed to come from the 1920s - 60s. I would have ordered things differently, and not included a picture of goddamn Ernest Hemingway at the introduction. Several selections were exactly what I'd desired: pieces that say something new and profound by authors who excel at their craft but who have been mostly overlooked. Ha Jin, Katherine Mansfield, and Yukio Mishima especially stuck out. Unfortunately I first had to trudge through Stephen Crane, F. Scott Fitzgerald (whom I no longer respect), John Cheever, Hawthorne, Hemingway, London, etc. This is one of the few books I purchased rather than got from the library because of its size and scope, but also because of its -- ultimately empty -- promise of "advice from 52 of the world's most acclaimed writers" on plot, character, style, and suspense. Yeah, no. More like ramblings on life philosophies, responses to critics (#dontcare), and meaningless drivel in the vein of "when plot becomes the outward manifestation of the very germ of the story, then in its purest -- then the narrative thread is least objectionable, then it is not in the way" (Eudora Welty). Still, they did include Borges, Joyce's The Dead, and opened me up to the magnificent D.H. Lawrence. Also, although her spiel was supposedly on suspense and offered no advice about that specifically, I loved this gem from Flannery O'Connor: "...in my own stories I have found that violence is strangely capable of returning my characters to reality and preparing them to accept their moment of grace." This book is an excellent short story collection, but what I like the most is that the selections are paired with reflections in the writers' own works about their writing and philosophy of writing. The back of the book has some excellent ancillary material that is helpful to students. Highly recommended. All the "classic" short stories writing teachers ever need to teach are compacted into one convenient anthology. What I find most convenient are the author's brief biographies and the ideas and inspirations behind the short stories. Both authors and titles are listed on the blurb page. This was the reader that went along with my Intermediate Fiction Writing class this semester. We would read a story a week and respond to it. I really enjoyed the stories anthologized here and was definitely introduced to some new authors whose writing I really enjoy! 2. James Baldwin "Sonny's Blues"
3. Jorge Luis Borges "The Garden of Forking Paths"
4. Albert Camus "The Guest"
5. Raymond Carver "Cathedral" & "A Small, Good Thing"
6. William Faulkner "Barn Burning" & "A Rose For Emily"
7. F. Scott Fitzgerald "Babylon Revisited"
8. Charlotte Perkins Gilman "The Yellow Wallpaper"
9. Nikolai Gogol "The Overcoat"
10. Ernest Hemingway "A Cool Well-Lighted Place"
11. Shirley Jackson "The Lottery"
12. James Joyce "The Dead"
13. Franz Kafka "The Metamorphosis"
14. Ursula K. Le Guin "The ones Who Walk Away From Omelas"
15. Alice Munro "How I Met My Husband"
16. Joyce Carols Oates "Where Are You Going, Where Have You Been?" 17. Flannery O'Connor "A Good Man is Hard To Find"
18. Katharine Anne Porter "Flowering Judas"
This is the textbook that accompanies an MIT online course on writing short stories. It's very good. There is a wide variety of masters of the short story from whom we can all learn or just read to enjoy a good story. What I'm saying it works well with the course or just alone. Sad that it's out of print and outdated. Some of the authors are no longer living. However, their words, as we like to say, live on. A bit weighty and unwieldy so it's good to be situation where you can hold this and read This is the textbook that accompanies an MIT online course on writing short stories. It's very good. There is a wide variety of masters of the short story from whom we can all learn or just read to enjoy a good story. What I'm saying it works well with the course or just alone. Sad that it's out of print and outdated. Some of the authors are no longer living. However, their words, as we like to say, live on. And don't forget to read James Baldwin. As of November 23rd, 2013, I have read 19 out of 63 of these stories. My class that I was reading this for is ending, so I'm going to go ahead and put this on my "Read" shelf, but since I think I'll go back and read some more of the stories in here, I'll also put it on "Didn't finish" until I've read all of them. Oh, you know--some really great stories and some really boring stories. Some skippable material. Some interesting pairings of stories with essays from authors explaining their work. Some non-interesting essays/interviews. But all said, I'm glad I hit quite a few of these stories because you'd think I would have long ago. Classic stuff. I haven't actually read all of the stories in this book yet and don't intend on reading it the same way I would do with any novel or book of the sort, but I really like the format of this book and many of the stories in this compilation seem amazing. I'm really glad my English teacher made us buy this book. A really fantastic collection of classic short stories, ranging in authors from Joyce Carol Oates to Anton Chekhov. Also includes a bio page for each author and a corresponding short "Author's Perspective" about some aspect of craft. A MUST read for students of the short story. I use it when teaching undergraduate short story classes. school text for a year (?) and is still a delightful shelf keep. during As prep, i would come back home from school, sit on the dining room floor, hunched over and completely immersed in a story picked at random. can count on this book to surprise you with a new author/new story. and then spirits lifted, i get back to work. Another fantastic collection of short stories by short story masters--some that you expect to find in such a collection, others off the beaten path. The book also includes several essays by many of the authors on their writing processes. Which I like to see. Great resource for reading the masters and learning some tidbit about their thoughts on writing. Great for teaching creative writing. The masters of short story writing from Sherwood Anderson to Virginia Woolf. Each story comes with an article or essay written by the author. A true inspiration to my own writing. A collection of truly great stories by masterful artists. A must read if you love reading and writing short stories. This was a required reading for my graduate course, Topics in American Literature. I used this one for a novel and short story course, and it had all the stories I needed and more. During my winter holidays, I hope to read the stories that I haven't read before. Gioia's reviews have appeared in many magazines including The New Yorker, The Atlantic, The Washington Post Book World, The New York Times Book Review, Slate, and The Hudson Review. Gioia has written two opera libretti and is an active translator of poetry from Latin, Italian, and German. The Big Read became the largest literary program in the history of the federal government. By the end of 2008, 400 communities had held month-long celebrations of great literature. Because of these successes as well as the continued artistic excellence of the NEA's core grant programs, the Arts Endowment, under Chairman Gioia, reestablished itself as a preeminent federal agency and a leader in the arts and arts education. Renominated in November 2006 for a second term and once again unanimously confirmed by the U.S. Senate, Dana Gioia is the ninth Chairman of the National Endowment for the Arts.